This morning Facebook’s Instagram released video capability. The upgrade allows users the option to post video clips to their feed. When creating a post simply click the video icon to switch to video capture mode. Find your subject, press and hold the record button and voila!…you’re recording a video! Release the button to pause your recording. Press and hold again to continue building your clip to share with the world. Sound familiar? The functionality is painstakingly close to that of Twitter’s Vine app that was released on January 24 earlier this year. So what’s the difference between Vine and Instagram’s video? Not much. 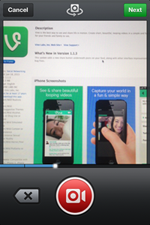 Vine was the first app to allow users to create and share unedited, on-the-fly video clips. Vine is fun and easy to use. The videos on Vine are engaging, fun, and personal. Even celebrities show their faces on Vine and often give an uncut behind-the-scenes perspective to their everyday lives. It seems like the launch of Vine was a great success. Comedy Central used the revolutionary app to host ComedyFest, in which a number of famous comedians did their best to produce a laugh within a 7 second Vine clip. It seemed like Vine was making great progress with a growing audience, but will Vine last now that Instagram matched their app with video support? Highly unlikely. Why doesn’t Vine stand a chance? Although there are a handful of users on Vine, there are still big hurdles that prevent people from committing to the app entirely. Searching and finding your friends on Vine is not easy. For instance, my Vine name is “ant”. I loved that the handle was still available (it was taken by the time I tried to grab it on Instagram), but when I told my friend to look me up it was impossible to find my profile. Click explore and type “ant” and my profile is nowhere to be found. Although I do enjoy watching the posts of my friends and Questlove (he seems to have a lot of fun with it) I find myself not using the app much because there’s no audience for me there. Call me selfish, but who wants to create and share posts that their friends can’t find? Instagram stabbed Vine in the back, but is Vine dead? Yes. Vine doesn’t stand a chance. Sure, it may live on to serve an underground community who like it because it’s just that…underground. If it doesn’t stay that way it will probably lose its audience too. Don’t get me wrong, Vine is great and I do enjoy using it. I just can’t see it lasting very long now that Instagram has taken a hold of the market. In fact, Instagram’s video features are already expanded to provide better capabilities than Vine. Why is Instagram video better than Vine? First off, Instagram video has built-in image stabilization that works pretty well. That shaky video clip that you took while walking down the street won’t give your followers a headache. Instagram also included a new set of effects for video clips that users are sure to appreciate. As opposed to Vine, Instagram does allow one editing feature; if you don’t like the last capture in your sequence, you can take one step back and try again. Instagram is definitely trying to “one-up” Vine in every aspect. Video clips can be up to 15 seconds whereas Vine allows only 7. What is Vine again? Screw it, I’ll just go back to Instagram. Instagram users are sure to appreciate the video feature. Those that cared enough to switch to Vine are probably getting sick of explaining to their friends why they should get on it, and how to find their profile. Vine is a fun topic of conversation as the new cutting-edge social network, but it may just have been the latest fad of 2013. What do you think? Will Twitter’s audience support Vine enough for it to stick around?